The publication from Age UK builds on the charity’s Index of Wellbeing in Later Life, and found that taking part in ‘creative activities’ such as the arts is closely linked to a strong sense of wellbeing in later life. Taking part in activities including dancing, playing a musical instrument, visiting museums, photography, singing and painting are unsurprisingly more prevalent among older people who are in good health, have access to transport, and friends to do things with. Factors such as heavy caring responsibilities, living in a rural area and being unwell make it harder to get out and about and try new things or to keep up activities that have previously been much enjoyed. To combat these limiting factors Age UK is calling for organisations throughout the UK to provide a wider variety of accessible creative activities for older people to get involved in. Age UK highlights examples of creative activities that can be enjoyed by a wide range of older people including seated dance classes and art sessions in sheltered housing and care homes, demonstrating that reduced mobility and ill health need not necessarily put an end to an older person’s engagement in creativity. In addition, the research found that having limited access to transport is one of the main barriers preventing older people from taking part in creative and cultural activities. 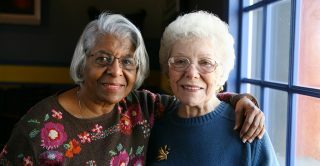 Age UK is therefore recommending that local transport authorities, arts organisations and community bodies work together to make it easier for people to get to events and activities, and consider how they can reach out to more older people who may otherwise be left out, such as those who live in care homes. Caroline Abrahams, Charity Director at Age UK, said: “Age UK’s research highlights the importance of staying in touch with the world around you in later life– whether this is through social, creative or physical activities, paid work, or by belonging to some form of club or community group. There are multiple benefits, including to our physical and mental health, and it really can make a big difference to how older people feel about themselves and their capacity to enjoy their later lives.